in the Langmeil cemetery at Tanunda, S.A.
Gemeinen bis an sein Ende. Am 12.
stehe in seinem Theil am Ende d: Ta. Memorial to the late Pastor Ludwig Christian August Kavel, born in Berlin on 3rd September 1798. From 1826-35 he was Pastor in Klemzig near Züllichau (now in Poland). 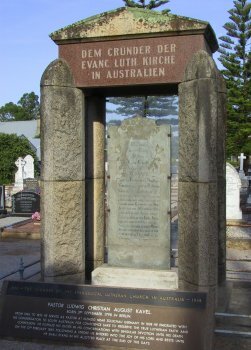 In 1838 he emigrated with his congregation to South Australia for conscience sake to preserve the true Lutheran faith and confession. With exceptional devotion he carried out his duties in his congregations up until his death. On 12th February 1860 as a result of a stroke he joined his Lord and rests until he shall stand in his allocated place at the end of the days.